This refreshingly pungent polemic discusses the disappearance of dissident working-class voices in mass culture articulating resistance to the status quo - replaced by poverty-pantomimes of ersatz simulations perpetrated by relatively privileged 'artistes' which reinforce the prejudicial caricatures peddled by the rest of the chattering and political classes. Early chapters convincingly chart changing UK media representations of the lower-classes since the 1980s, focusing on now-universal 'chav' mythologies and the demonisation of rough femininity deployed to legimitise the withdrawal of welfare and related punitive neoliberal governance based on individualised moral judgement and disgust and the differentiation of an abject absolute 'other' justifying austerity for everyone except elites. Clampdown then recapitulates these developments in the cultural terrain of pop music - or, at least, that fraction involving 'indie' guitar bands who progressively lost sight of post-punk's grass-roots DIY ethos, yielding today's exceptionally anodyne corporate offerings exemplified by the execrable 'nu-folk' which, like most best-selling homegrown genres, is largely produced by comfortable children of the aforementioned elites. 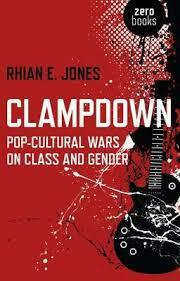 Exploring this trajectory, Jones sets the 1990s unravelling of explicit Thatcherite class-war against sympathy for Lady Di mobilised by New Labour in class-blind nationalist sentimentality. So 'Cool Britannia' counterposed the exaggerated swagger of Oasis against pretentious hipsters like Blur, but artistic 'substance' (such as it was) for all of their ilk lay in rehashing 1960s styles with minimal echoes of punk's raw anger to signify residual resonance with popular dissatisfaction. Throughout this postmodern masquerade implying political passivity and acceptance of the mainstream consensus, rebellious exceptions such as the Manic Street Preachers - and especially those expressing young women's perspectives, from the riot grrl phenomenon to indie outfits like Shampoo and Kenickie - were condescended to, patronised, recuperated or sidelined irrespective of mass appeal or sales. Meanwhile, superficial alternatives amenable to prevailing hegemonies, from Britpop to Spice Girls, flooded markets with New Lads and Barbies with 'girl power', domesticating or ironising stances otherwise associated with threats to capitalist order. The book's treatment of its chosen genre represents a compelling case study of dovetailing discourses accompanying epochal developments in political-economy with trends in cultural commodification. A particular strength is the incorporation of biographical reflections on the author's emotional investment since adolescence in both musical and intellectual journeys. * But this can also be a weakness, evidenced in even stronger final sections concerning the present conjuncture - necessarily broadening the scope to encompass popular culture as a whole while revealing significant limitations in the thematic thrust of the foregoing analysis. After all, isolated provincial white teens glued to the radio reading the NME scarcely captures the scenes, subcultures and innovations of collective youth culture - witness the arguably far deeper and potentially radical upheavals of hip-hop and techno mobilising millions who shunned the miserable grungy dirges favoured by student union tastemakers. Nevertheless, as a demonstration of how class composition and stratification - intrinsically riddled with gendered and (by omission, here) raced discriminations - is central to late-capitalism's social regulation, Clampdown is exemplary. * see also her excellent Velvet Coalmine blog. Review first published in Freedom, Vol. 74, No. 11, December 2013.